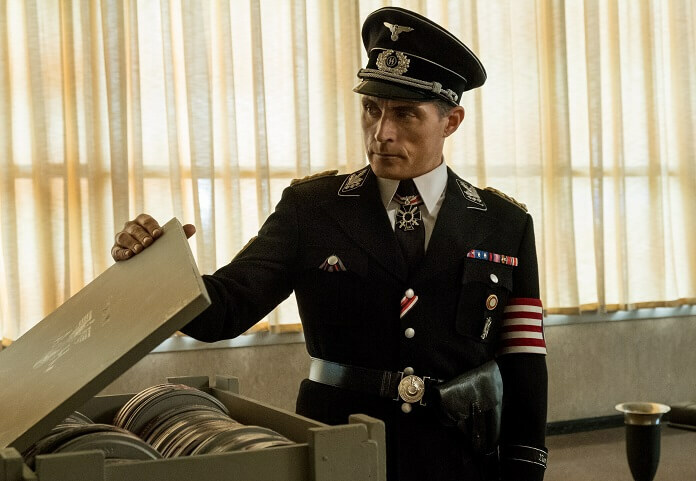 Amazon’s The Man in the High Castle cast members and executive producers took part in a panel at the New York Comic Con in support of the show’s third season. The new season premieres on Friday, October 5, 2018 and with it comes a word of warning for those who aren’t necessarily into binge-watching. Prepare yourselves for being unable to turn season three off before you make it through the season finale. Season three of The Man in the High Castle is absolutely spellbinding. Among the cast members who participated in the season three panel at the NYCC were Rufus Sewell (‘Obergruppenfuhrer John Smith’) and Joel de la Fuente (‘Inspector Kido’). Paired together for roundtable interviews, de la Fuente and Sewell discussed their characters’ journeys, what it is that drives Sewell’s John Smith in season three, and life on the set of the riveting drama. The show’s a drama but it’s also a sneaky heavy special effects show. What’s your interaction been with the green screen and effects elements? What do you think is John’s primary driving force in season three? Rufus Sewell: “It’s never changed. His driving force has never been personal ambition. That’s like an offshoot. The more danger his family is in, the more it looks like he continues in power – and greater power. The more danger he’s in, the more he needs to cling to the machine that’s putting him in danger. The reason he made every choice is, ill-advised possibly, but in a very, very difficult situation facing choices that most of us would never hope to face, he’s always sided with what he believed was the side that would protect his family. And, in the circumstances, the best moral choice. I don’t believe he made the right choices, but I believe he believed he did at the time. Not to say that he’s not capable of lying to himself and sustaining a false narrative to keep him going, like people do. Has Smith’s sense of identity changed in terms of dealing with Thomas? Rufus Sewell: “I think when what happens to Thomas happens, I think he becomes even more split and divided from exterior to interior. It pushes him further into himself. I think his interior is angry, betrayed, rageful, guilt-ridden, dangerous. I think he hugely resents the machinery that’s done this to his child. He resents himself and feels culpable, but he has to make the appearance of moving the direction of the opposite. So, all these feelings are very, very confused. Does he have any regrets about his choices? What gets you into the mode of John Smith? How are your characters evolving and changing over the course of the third season? Do you ever find time to have fun on the set or is it just all work and no play? We heard something about you doing a ballet in full Nazi regalia.